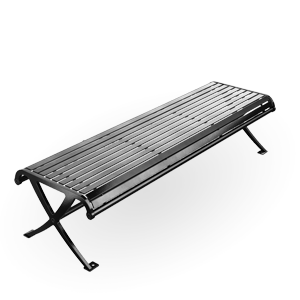 Castle NC1-1100 uses horizontal straps and laser cut steel plate ends for it's backless bench design. This bench is heavy duty and stands up to any environment. Seat straps are 1 ½" x 5/16"
Choose six or eight foot length; zero or one center armrest; Powder-Coat or Duracoat finish; and color. 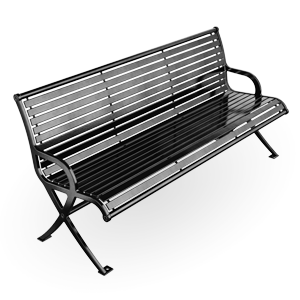 New Castle benches have a recycled material content of 99% of which 87% is post consumer content. This content may vary based on the product design, product material type, and interchangeable piece parts. All styles are 100% recyclable. For more information about SiteScapes sustainable products and policies, please refer to our Environmental Statement.